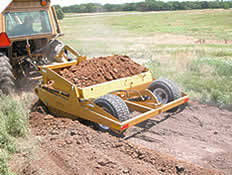 The "Dump-Bowl" Scraper gives real earth moving ability to small tractors. 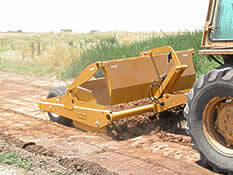 Move dirt fast, with agility and efficiency from one location to another, without dragging it over grass or sidewalks. 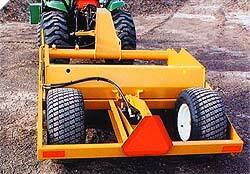 Pulled behind a 35-50hp tractor, this unit can dig ponds and ditches, shape playgrounds and golf courses, or level roads and driveways. It's as much at home in metropolitan developments, as well as on the farm. The trunnion style hitch and gooseneck frame provide for up to 90 degree turns, with 30 degrees of oscillation, for exceptional agility on rough terrain. 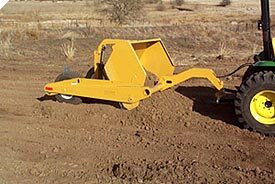 Material can be spread thin or stock piled, with full control of the bowl dump angle and blade height. 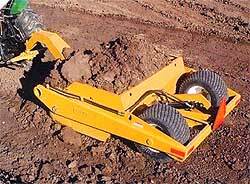 The "segmented frost bit" style blade increases penetration in hard soil, while maintaining a flat cut. Narrow over-all width allows for working close to buildings or other obstructions. 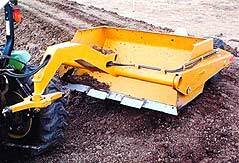 Large tires give flotation in soft soil.